The ISR Foundation conducts interdisciplinary research on various topics of public interest, such as evidence-driven public policy studies, research on separated families and forecasting the results of American and Korean elections – presidential and midterm elections - among others. Evidence-based Research and Studies (1998 - present). 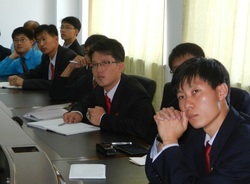 The ISR Foundation has presented since 1998 a number of interdisciplinary research and studies of DPR Korea issues and policy options to governmental and nongovernmental institutions, UN agencies, the NGO community, leading academic organizations and international gatherings of stakeholders that are interested in engagement between DPRK and the international community. Audience of ISR research briefings included US Department of State, US Agency for International Development, House International Relations Committee, Senate Foreign Relations Committee, the UK Foreign and Commonwealth Office, the Royal Society of the UK, the national representatives of the Republic of Korea, ROK Ministry of Foreign Affairs, ROK Ministry of Unification, and European Union among others. relevant to Asia, but also in the students as future scholars and leaders of Asia and the global research community. Successful research proposals detail a creative plan for interdisciplinary research with pragmatic applications. Students should incorporate their main disciplines with at least two other fields that include survey methodology and statistics. In addition, students should demonstrate how the research project fits into their projected plans for study or work at the hosting university and beyond. Examples of possible research topics include, but are not limited to: improving international business management by incorporating survey data and statistical analysis, evaluating agricultural programs by collecting survey data with farmers, designing and testing an educational assessment survey for high school or college students, developing a method of survey data collection by cell phones, or crafting a computerized method of linking big data such as international surveys, census and administrative records, etc. conducted for a year, the number of ethnic Korean-American citizens who have the immediate family members remaining in the DPRK is estimated over 104,000. He noted, “I wish that this data may be used to inform the Congress and help pass a bill to support the right of separated families to meeting their family members in DPRK." The U.S. Congress and media frequently use this research-based survey estimate as a semi-official estimate of the number of American citizens of Korean ethnicity who have their immediate family members left in DPRK. The US Congress has passed resolutions to support the right of separated American citizens of Korean ethnicity to meeting their loved ones in DPRK. Senate in 2006. The ISR also accurately forecasted a win for President Lee Myung Bak during the 2007 presidential election in the Republic of Korea.